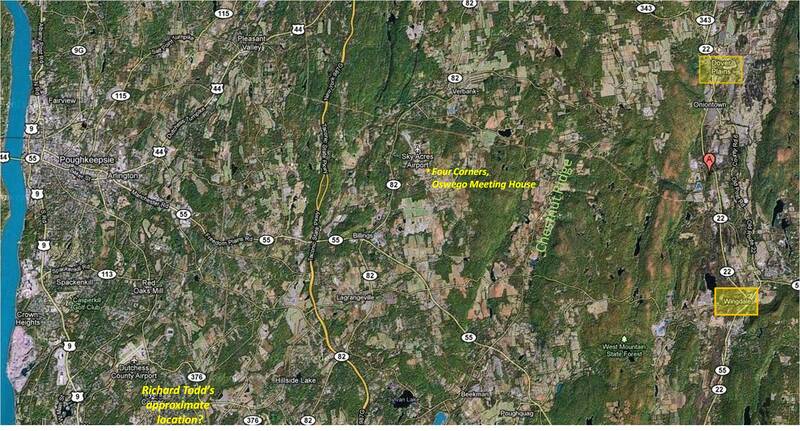 Note: The inventor of Metalic Tractors is Elisha Perkins of eastern Connecticut (see map below), patented ca. 1796. Most of the photos for the tractors are from Alex Peck, Antique Scientifica (http://antiquescientifica.com/catalog.htm) or the National Library of Medicine website(http://www.nlm.nih.gov/). Other important resources are noted at the end of this page. The large number of newspaper photos come courtesy of the Adriance Memorial Library, Poughkeepsie, NY, who possess the microfilm of this historical newspaper – the Poughkeepsie Journal. This stories about Quaker Daniel S. Dean of Oswego and John Todd of Fishkill of unknown religious background provide us with the unique opportunity to actually map a series of tales about Dutchess County medical history that are still in need of publication. Many of the topics I have researched over the years came from leads I obtained between 20 and 30 years by Dutchess County historian Helen Wilkinson Reynolds. Mos. Reynolds however missed this clue about medicine while reviewing the local newspaper, the Poughkeepsie Journal, which was published ago very early American history. For this reason I am telling this story of two of our local metaphysical dictors for the first time. Daniel S. Dean lived in the Quaker hamlet of Oswego just south of Verbank. He lived over near the Oblong Patent, just west of which there was this small mountain range that divided the main portion of this county adjacent to the Hudson river from its cultural counterpart in the Harlem Valley close to the Connecticut border. According to the township maps for this time, John Todd resided north of the current villages of Fishkill and Wappingers, and a little south of the border of the town of Poughkeepsie. Based on a variety of descriptions about the town of Poughkeepsie and the township of Clinton (today this is Wappingers, etc. ), John Todd far enough from Amenia to suggest he may have not been as active a Quaker as Dean was during their years of marketing, and perhaps for John Todd, manufacturing these new-found remedies. In 1797, with the help of Daniel S. Dean in the Oswego hamlet a couple of miles south of Verbank, NY, John Roberts Todd brought Perkin’s Metallic Tractors into the heart of the Mid-Hudson Valley. John Todd was born in Fishkill. His parents were Robert (b 1741, d 1824 Fishkill, Dutchess, New York) and Elizabeth (d. 1826). Daniel Dean was a Quaker, for whom little can be told about the family history at this point. No matter. A recent attempt I made to develop more insight into this history provided me with evidence for a tantalizing piece of this story I never expected to see develop. 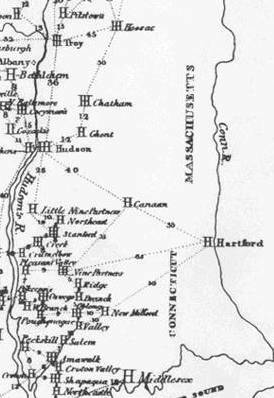 Was it possible that the founder of a new form of medicine involving the use of ‘metalic points’ had a relative in the vicinity of these two villages that assisted in the diffusion of this knowledge into the Hudson Valley? 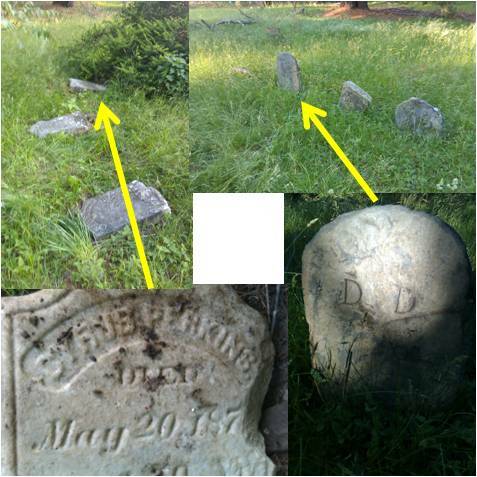 After several hours of walking through a Quaker cemetery, leaving no stone unturned as some might say, I found the evidence that told me this could be the case. I was already a few days into reviewing the Friend’s Meeting House and the cemetery, about to leave again for the day, when I took one more stroll through the tall grass beneath some trees to see if there was anything I missed. Several stones were close to the trees and shrubs and due to the poor lighting and significant weathering they were much harder to read. Some were worn nearly flat from the rain and such. One of these had “Wife of Perk ~” chiseled into it adjacent to the broken edge. Then it suddenly came to me. I never really knew or thought about whether or not Elisha Perkins was a Quaker or possibly had relatives who were Quakers. I then took at look at the adjacent stones in this section, and turned over one with the complete name ‘Perkins’ inscribed on it. This gravestone for a family was by a few decades more recent than another stone I had found a little further down the cemetery. 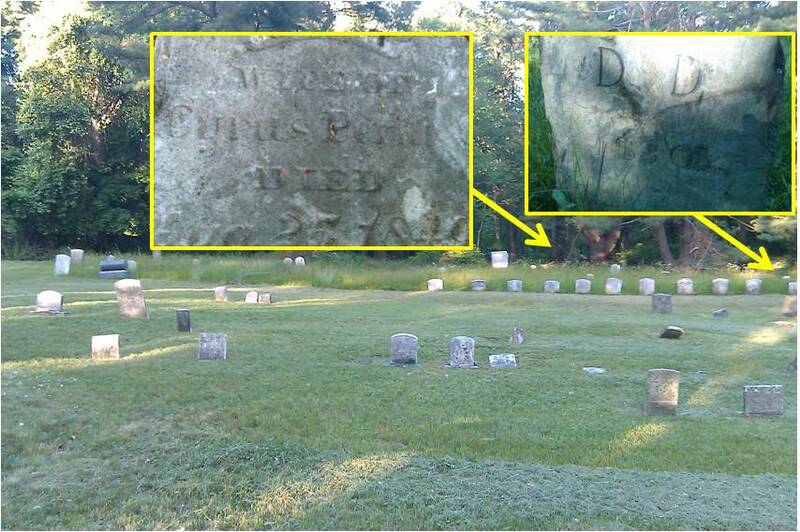 Dean’s family was several rows away from Perkin’s headstone; it had “D.D.” chiseled into it. The Perkins family in this cemetery whom I noted was from a generation or two later, but the possible link between the Perkins and Dean families offers us an interesting story about how and why this metaphysical form of cure became so popular in the valley. Even if Elisha Perkins, the American inventor of medical electricity, was not an actively practicing Quaker, his philosophy would have been very appealing to the Quakers. Local Quaker physician Dr. Shadrach Ricketson said so himself in a book he would write and publish just seven years after Elisha Perkin’s philosophy took off in popularity (see other pages on this site) in 1797. The Oblong Patent at this time stretched from the Massachusetts-New York-Connecticut border, close to where several other “alternative” medical philosophers lived (Arkalus Hooper, Puritan, and possibly Caleb Child, medical electrician-to-be), to areas as far south as the southern edge of Dutchess County. This patent was a high elevation region, the Taconic Mountain Ridge, bordered by two long valleys to the east and west–the Hudson Valley and Harlem Valley respectively. The Harlem Valley in turn was formed between the Taconic and Berkshire Ridges. Such a topography formed the perfect route for travellers and commerce along what would later become very important commercial routes, two roadways along which two railways leading to New York city were established. The Hudson Highlands to the south formed a partial border, preventing too much of the political influence of regular doctors in New York City from preventing any “new age” healing practices from developing in the distant valleys of lower New York. This demonstrates how from 1790 and 1820 approximately, topography and public transportation had everything to do with how new healing faiths would be preached and practiced, a feature of local medical history confirmed primarily by a review of the local newspapers. 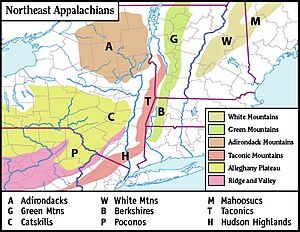 Wikipedia site http://en.wikipedia.org/wiki/Taconic_Mountains: mountain ridges in lower New York. 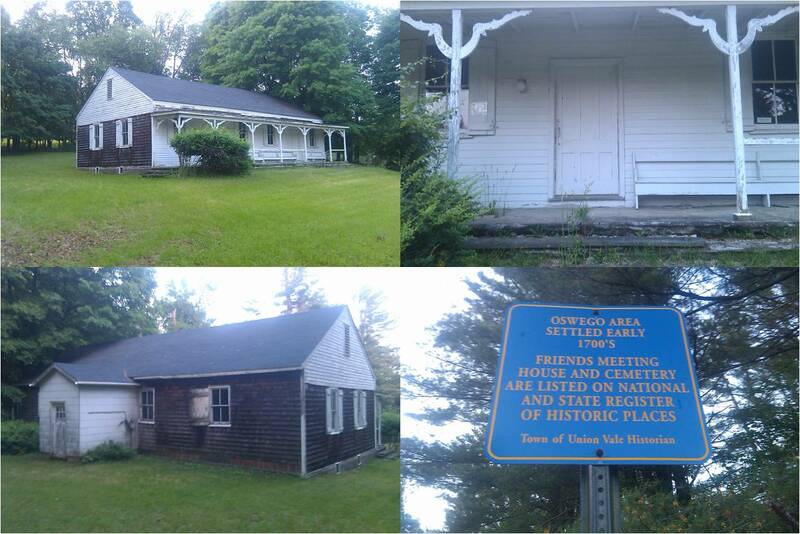 According to Quaker tradition, the Friends in upper Dutchess County held Annual, Quarterly and Monthly meetings. During these meetings members would have had the opportunity to share their knowledge about whatever new philosophies were brewing within their neck of the woods. 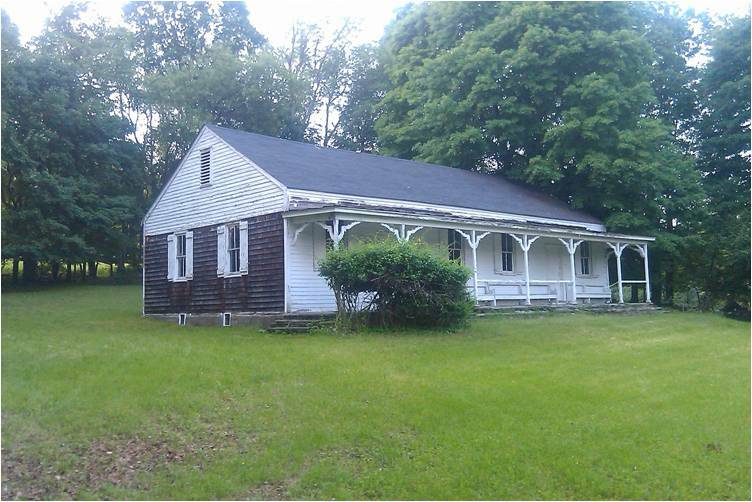 Along the New York-Connecticut border is where many of these meetings were held, and it was the meeting houses that often served as the initial point, away from which many of these philosophies about healing were diffused. 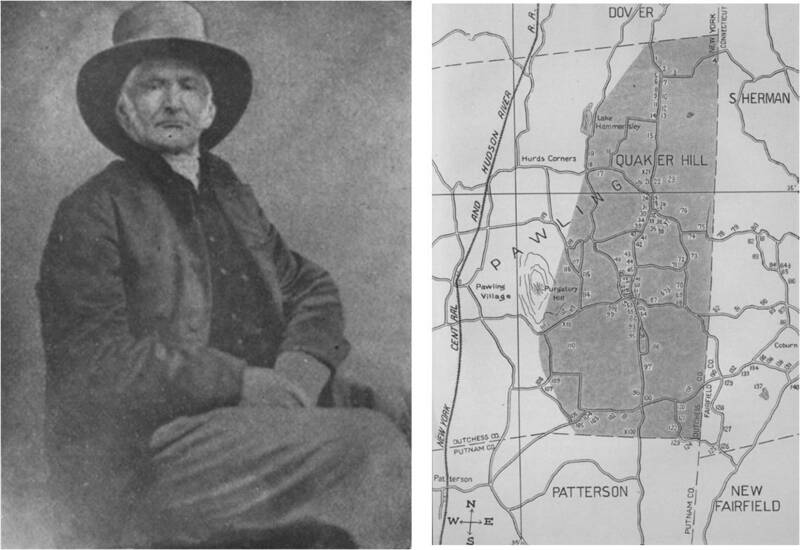 Due to a well-established roadway set up along what is now Route 82, and the route along the current Route 55 then existing, the means for spreading Perkins’ philosophy to Poughkeepsie, Dover, Amenia, Millerton, Oswego, and ultimately Fishkill and Wappingers was established. It was Daniel Dean who brought this philosophy into the Oblong Patent (north and south of the ‘A’ on the map above), making metalic points a part of his local community’s natural philosophy. Afterwards, John Todd brought this piece of Quaker metaphysical tradition into the main stream of traditional Christian religions within the Hudson Valley. Both of these individuals made medical electricity an important part of Hudson Valley medical history, as evidenced by the initiation of another medical electricity tradition by Quaker Jedediah Tallman of the Wingdale-Chestnut Ridge-Pleasant Ridge area just south and west of Dover Plains. What regular medical historians and even its inventor just one state over had come to know as “metallic tractors”, the local followers of this philosophy like Daniel Dean and John Todd came to refer to as “pointers”. The possible origin of this name is related to the word “detractor”, meaning to draw or take away. The use of the word “pointer” is more suggestive of the mechanism by which this is done–by pointing the objects in the direction from where this detraction is purportedly done. The main question left unanswered is did the Quakers invent their own version of Perkin’s contraptions, or did they simply rename it for marketing sake? The latter is the probable answer to this question. Elisha had a patent on this instrument and so its illegal manufacturing and use would have been discovered in due time. This means that more than likely Dean and Todd had received the rights to market Perkins’ tractors locally. But Perkins did not just offer the rights to sell to his supporters. In some cases, he offered the right to produce these instruments as well, which very well could have been the case for this part of the county and state. Other parts of our local history tell us that there were numerous mining operations and smelting furnaces set up in this region since colonial times (recall the Dover Furnace and the Livingston’s Ancram iron mine). It is possible that either of these two may have been associated with some sort of metalsmith, who could have been given the rights to produce these devices due to this very rich geographical setting for the development of metallurgy businesses. 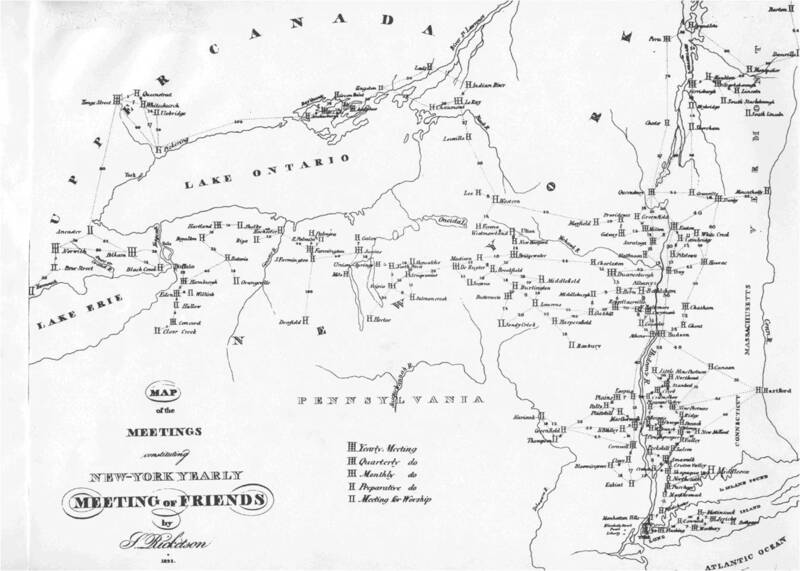 Based on a review of the Friends Meeting House map produced by Shadrach Ricketson, which contains the distances one needs to travel between houses, we get a better idea on the local diffusion process that might have taken place during the late 1700s and early 1800s as Perkin’s philosophy came to New York. We know from the newspaper items that Windham physicians played an important role in the popularization of this faith (reviewed again later on this page). Windham has a direct connection to Hartford and from there to New York State by way of two major city centers. 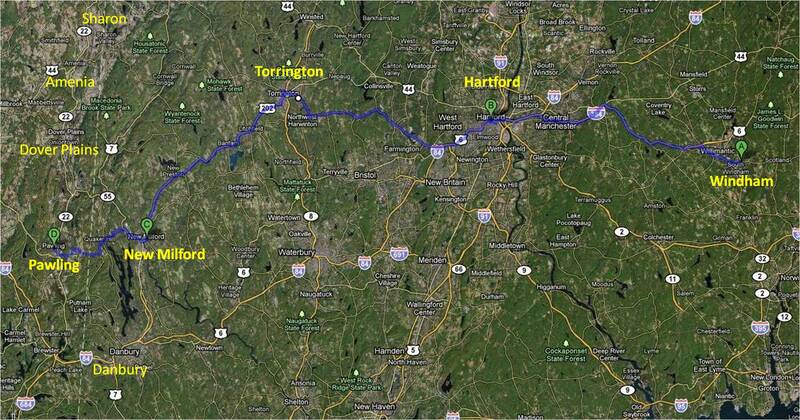 It is surmised that the Torrington route was taken due to proximity of Danbury to the political powers of the status quo (regular physicians, politicians and legal houses). Two additional routes are worth noting, the road along which is now Route 55 heading from New Milford to current Route 22 leading to Dover Plains, and the roads loading from Torrington to Sharon and then Amenia and Millerton, and from Hartford northwestward to Canaan and the Hudson and ultimately, Troy, NY. These are Quaker roads, the latter of which would be responsible for the 1802 publication of an extensive treatise on medical electricity by Thomas Gale printed in Troy (see work on Ricketson as well for more on this). Whatever the reason, this new medical industry had its start for New York due to Quaker influence and Quaker philosophy. The name ‘Metalic Points’ was given to the devices due to the fact that they had to be pointed in the direction of the organ afflicted or diseased, touched to the surface of the body or held above the skin for a few minutes or longer to get rid of illness. The philosophy for this method of healing was based on the belief that there was too much electric energy stored beneath which was in turn causing the medical condition to occur. To treat the condition, this electricity had to be removed from the body by using a set of “points” made of two different metals. At least a few members of the medical profession in Connecticut supported Perkin’s findings . . . 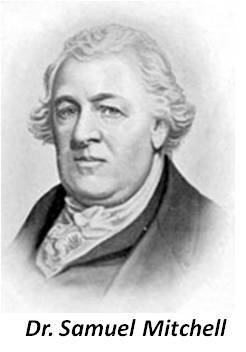 The physician being supported by the above members of the Connecticut Medical Society, at a Convention held in Windham County on August 16th, 1797, was Elisha Perkins. Elisha was the son of one of the most famous physicians in Connecticut, Dr. Joseph Perkins. Dr. Joseph Perkins worked in Norwich, Connecticut and was one of the first members on the state’s medical society. He served in the Revolutionary War, and became one of the first to develop a number of important laws for the state related to the practice of medicine, the apprenticeship training process, and the licensure procedures. His relationship with son Elisha was at times questionable. He trained Elisha in medicine by way of an apprenticeship, but soon after completing this training Elisha moved away to the town of Plainfield to try to become his own success. Like other physicians for the time, Elisha got involved with community events, in particular the establishment of schools for the area. He worked some of the time as a surgeon, and was taking the right path according to the medical profession, working on the studies of several new medications of potential use to his patients. In 1795, he then became Chairman of the Windham County Medical Society, and was then elected by the society to represent them as a delegate at the upcoming state meeting. But by the time the meeting was scheduled, Elisha had made what he felt was an important discovery, which led to his announcing this finding at the meeting around the end of the year. Perkins’ discovery received limited support from the rest of his profession. Those who were most against him and his philosophy identified it as a variation of the mesmerism that became so popular two decades earlier. A number of other colleagues who refuted his claims stated the same, and one year later, in May 1797, due to the large numbers of physicians disputing Elisha’s philosophy and beliefs, they took a vote and expelled Elisha from the Connecticut Medical Society. Elisha’s history with his peers in Connecticut was in great contrast with his relationships with the common people and even some of the MDs of New York and Pennsylvania. This was not due to the possibility that physicians in New York believed in Perkins’ claims. Rather, it was because they had their own philosophies that they were interested in with disease, and Perkins’s philosophy was just another that at times seemed to parallel some of the philosophies that New York doctors had for the time, philosophies like the belief that natural electric events could be the cause for disease, or old timers adhering to some of the earlier Dutch concepts of diseases and vitalism–a theory focused on the flow of energies in the body. In addition to this common thread linking Perkins to parts of the New York attitude, were the political problems that existed between the physicians in New York and Connecticut. This was much like the same problem that existed between New York and Philadelphia’s physicians, who like New York and unlike Connecticut had their own medical school to brag about, along with a medical journal that was not quite as popular as New York’s Medical Repository and less distributed. The physicians in New York were fairly busy with their own points of view about the diseases locally, and physicians in Connecticut were slow at providing professional support to their “intellectual competitors” in Philadelphia, New York and Boston. In the long run, New York doctors could not be troubled by a Connecticut philosophy that was bred by a practitioner residing in a state right next door. However, the common people of New York were not so deaf to or disinterested in Perkins’ claims, and quite soon they became his strongest supporters. In just a year, Perkins’s following made its way to the western edge of the state and south to Philadelphia. Countering Perkins’ philosophy in New York were the urban physicians involved with the New York city medical school. However, up the Hudson River, these professors had a minimal influence on Perkins’ followers. This allowed for his patented remedies to take a firm hold of the local cultures situated in this very unique part of New York, the core of Quaker tradition. Quakers were immediately attracted to Perkins’ beliefs for obvious reasons. Perkins’ way of curing was purely metaphysical and spiritual in nature, even if that spirit was nothing more than some form of “electricity” related force. This separation of the force involved with the healing process from its natural forms of existence in nature, by defining it as a manmade form of this healing energy, was not so upsetting to Quakers due to their traditional definition of God. God was to Quakers a natural spirit or substance of non-material existence. To Quakers, God was in everyone. To Quakers, God was universal energy. They were probably thinking, could this perhaps be what Perkins had discovered? the way to communicate with this natural form of God-like Universal energy? To religiously minded inquirers into Perkins’ Pointers, Perkins was right and the irreligious conforming “atheists” who called themselves “Doctors” were wrong. Meanwhile, down in New York city, Samuel Mitchell, the leader of the profession in lower New York, was into his own increasingly popular climate theory for disease. He invented own version of the “phlogiston” theory for disease, claiming some undiscovered chemical was the cause for certain illnesses; this unknown substance, according to Mitchell, could have been produced in the local soils and geology, or the local dumps riddled with rotting garbage, swamp waters, butcher remains, decaying animal bodies, and such. During the months that Perkins points were becoming a rage up and down the Hudson River, Mitchell and his colleagues were on their own missions trying to define a way to predict and prevent disease using Mitchell’s new version often referred to as the effluvium theory. Mitchell felt that by avoiding phlogiston, and making up for one’s inability to adapt to the local topography and climate, that the body could be strengthened and made to endure the brunt of nature that were often linked to the local epidemic and endemic disease states. In retrospect, some these claims could have been interpreted as another rendering of the old miasma theory for disease which nearly everyone in this field once believed in–the production of effluvium by decaying debris located in shipping ports, decaying marshlands, and places where people resided in crowded living quarters close to the natural elements. These claims for the cause had their economic importance, an underlying fact that a Congressman like Samuel Mitchell was fairly familiar with. Mitchell’s theory for disease made it necessary that we change out living practices. Since nature and the natural elements of climate, weather, water and winds came to play a role in the formation and dispersal of this effluvium, Mitchell claimed that unacclimated members of New York how to learn how to best protect ourselves from it. He and his colleagues suggested this could be done by people of the local countryside producing warm clothing for the more at risk unacclimated recent settlers to wear. This became the primary philosophy held by the non-metaphysical physician of the Hudson Valley and New York City. They felt that by wearing clothing, we could protect ourselves from any of the natural elements responsible for disease, like the cold seasonal winds in the winter, spring and fall, or the hot humid environments of the summertime. As a result of practicing this form of preventive medicine, we could live longer and experience less medical problems. Such a practice of prevention along with the developing practice of quarantining incoming shipping vessels that bore this effluvium, would in just a couple of years successfully prevent future epidemics of disease from re-entering this country and sickening its inhabitants. It is also for this reason in fact that the wool industry took such a strong hold of the Hudson Valley’s economy during the late 1700s and early 1800s. Doctors felt that to stay healthy, one had to wear wool clothing made locally. To the businessman this was simply the suggestion that we begin to produce out own domestic wares, instead of rely upon those which had to be imported and were therefore more expensive. This philosophy, quite different from Perkins’ teachings, resulted in a similar social movement along with the electric cure movement in the valley with the help of the Livingstons, Dr. Bartow White and others. This in turn led New York to set up a Society of Agriculture, Arts and Manufacture, for which one of the major goals was to establish this highly productive wool industry in the Hudson Valley (see Annual Report of this society, p. 110). All of these events were taking place as Perkins was attracting more of his followers out there in the regular community setting. One has to wonder–could both social movements exist in the valley at the same time? This “cultural diversity” developed due to the local practitioners. On the philosophical side, one of the more important social groups for this time in Hudson Valley history was the Quakers, people who were spirituality bound to Perkins discipline, as well as what any of the other physicians had to say about acclimation, adaptation, wearing wool, and staying warm. According to Quaker Doctor Shadrach Ricketson, living according to both of these preventive health disciplines served only to better the physical life, to make one’s metaphysical state of being more lively and more productive. To the regular physicians, politics and money had pretty much blinded their decisions as doctors and congressman about the important metaphysical movement about to take place in the local valley setting–for such a reason Perkins philosophy and Metalic Tractors or Points had to go. The valley’s medical doctors could only do one thing to control this state of disarray their profession was in. The state ultimately established a society and passed a new series of laws regarding the licensure of physicians for the State. This was accomplished in 1797 and 1798. However, this did little to disavow Perkins practice or prevent other from preaching Perkins’ philosophy and selling his patented devices. Perkins discipline might have been suppressed effectively by the regular doctors, but others like Jedediah Tallman, another Quaker, were standing ready to take Perkins place, and so the next stage in the development of medical electricity in the Hudson Valley commenced in 1799–the application of friction operated, glass cylinder static electric generators to rejuvenate the vital force in the ailing body. It is rather humorous to think about the chaos that Perkins theory and philosophy appeared to generate in the Poughkeepie area during the very late 1700s. The end of a century is always a time for socially-motivated revivals to take place. The people tend to questions themselves during this time, reflect upon their personal misbehavior and sins, and at times succumb to the beliefs that the next Armagedon is about to begin just around the corner. In the religious sector of society, Perkins’ philosophy was a sort of revival that these worshippers of God needed to become a part of. This helped Richard Todd with his efforts to take Metalic Points from an area linked to the heart of Quakerism and Puritanism in New York into the more Episcopalian and Protestant part of this state next to the Hudson River. In Poughkeepsie, it is made quite evident that the locals were not at all familiar with Perkins’ philosophy at first when news of its social impacts began to appear in thelocal newspaper. In the first article published in reference to this discipline, the writer and editor of this paper provide evidence suggesting they had no idea about what the philosophy of Perkins consisted of, and made an blatant error in the article describing Perkins’ medicine. This suggest that for the moment, any discontent felt on behalf of the neighboring state medical societies and the disputes regarding disease theory down in New York City was not a problem, public awareness of what Perkins had to say was the problem. So for this brief moment, the Poughkeepsie Journal and its people took an embarrassing step in the local history, which lasted about 2 or 3 weeks, mistakenly describing the seemingly unimportant and seemingly typical new discovery that Perkins had made regarding health and medicine. People were still not completely aware of what Perkins was stating and claiming about his miracle cures. Evidence for this comes in the form of a symbolic mistake the editors of the Poughkeepsie Journal made in 1797 when they published an article meant to spread the news about Perkins’ claims. None of Perkins’ philosophy was attached to its contents. We see this through one of the side stories the Journal published about local medicine, accidentally associating Perkins with the standard ideology out there on how to remedy a problem due to dysentery and the like. As a result, an article appeared in the Journal which confused Perkins with a common recipe for treating the severe diarrhea known as dysentery with vinegar. The following week, it had to be announced that the first article was in fact in error, and a corrected version of this claim published without associating Perkins with something as ordinary as the use of vinegar for treating diarrhea. But no matter, Perkins’ removal from the professional clique in Connecticut had only a moderate amount of impact on the success of his new business, and this brief mistake made by the Journal only furthered his cause in the long run by repeating his name, even if it was only for a couple of weeks. At the time it was primarily the core physicians and politicians on the other side that were causing most of his political, professional and even social grief for Perkins. Likewise, the fear felt by the state medical society was that as Perkins continued to be a success “down south” in New York and Pennsylvania, that his philosophy and claims would ultimately become an embarrassment to the state as a whole, which in fact did become the case to some extent. Those most devoted to Perkins’ teachings were fairly important social leaders, with impacts upon the other agencies and bodies of leadership that physicians had allegiances with. The church in particular was an important group supporting Perkins’ cause, as well as some key members of the legal profession. This was a form of social support that the physicians could not effectively control, even by branding Perkins to be a “quack.” This allowed the natural theological and natural philosophical interpretations of Perkins’ form of cure to take center stage over the next few months, the main reason for his and his philosophy’s continued success. Quaker tradition and philosophy alone was not going to convince the typical American citizen who attended church every Sunday. The regular Christians, the Catholics, Protestants, Episcopalians, and Baptists had to become in tune with this spiritual cause. One of the interesting things about spirituality and people is that masses of people often come to a mindset that some sort of ultimate test of spirit is about to take place whenever one century ends and another begins. This is what was happening in the Valley during the late 1790s. This is what allows new sects of religion to form and develop. This is what makes people question science, even during this early period in America’s religion, science and medicine history. Reviewing the Poughkeepsie Journal, it was during this time that Mother Ann Lee’s philosophy was published by its new name, “Shakerism”, for this first time by the Journal. This new term was mentioned in an article expressing gratitude and appreciation for what the Shakers contributed to the ongoing epidemics then striking the region of yellow fever, and the increased demands of the poor and ill for foods, two social causes which the Shakers donated most of their crops to for the late growing season. The average citizen was very much in tune with religion, and often contested physicians whose only interest in the human body and people seemed to be focused more on the science of the body, using it for scientific discovery and for medical conquest, all in the name of health and medicine, by then the purpose of most of the other newly discovered medical school “traditions” aside from metallic tractors and anything involving the vital force. So religion was ready for still another change during this little revival period. One believer in Perkins’ Pointers made this happen. Adding meaning to this possible religious interpretation of Perkins’ scientific discovery were the words of a Philadelphia religious leader Elhanan Winchester. Reverend Winchester was not your average churchleader. He was the founder of Unitarian Revivalism in Philadelphia, and one of several outspoken religious leaders in the region responsible for tying religion and science together into a single coherent philosophy (see http://www25.uua.org/uuhs/duub/articles/elhananwinchester.html). Rev. Winchester was in his last years of life when he offered support to Perkins for the importance of this discovery. About the time he wrote this proclamation, he suffered a “lung hemorrhage” while preaching in Philadelphia, and was treated by Benjamin Rush. He subsequently recovered, just long enough to produce several more sermons. He died two weeks after giving his final sermon in Hartford, Ct, in April 1797. To his onlookers and listeners, Rev. Winchester was probably quite unique in what he had to say. Read in Hebrew, he was born a Calvinist, but turned Baptist by the 1770s as a part of the “New Light” Revival that took place. This led him to become even more of an evangelical scholar and the publication of a book he wrote called Dialogues on the Universal Restoration, which was about the need for religion and church to become more in tune with the social attitudes about religion for the times. Soon after, Rev. Winchester converted once again, this time from Universal Baptist to simple Universalism in 1781, a religion he invented the name and meaning for. Throughout his Baptist years. Winchester was residing in a number of states up and down the Atlantic Coastline. But it was during his visit in Pennsylvania in 1782, while giving a sermon in Philadelphia entitled The Outcasts Comforted, that he attracted the famous physician Benjamin Rush for the first time, along with John Redman, the first president of the first Pennsylvania medical school–the College of Physicians in Philadelphia. Both Rush and Redman were strong promoters of the inoculation process, and as a part of their philosophy, had developed their own unique philosophies about how and why such a process would work in the prevention of such diseases like small pox. To Rush and Redman, Winchester’s preachings were probably taken as an example of the new natural philosophy being developed in parallel with all of that old-fashioned natural theology out there. According to a biography of Winchester (posted on the web at http://www25.uua.org/uuhs/duub/articles/elhananwinchester.html), Winchester was “our Theological Newton” in the eyes and mind of Dr. John Redman, to Benjamin Rush, he was “irresistable in his reasonings upon all subjects.” Unlike many of the other religious leaders, and Elisha Perkins, Winchester had some scientists and physicians on his side. Fifteen years later, Winchester was taken ill with the illness that would ultimately lead to his death. During these final days, one has to wonder how much did Winchester allow Dr. Rush to intervene with God’s interventions upon his life. As a natural theologian, the logical course for Winchester was to refuse Rush’s desire to bloodlet him and instead undergo the “metalic pointers” therapy instead, a metaphysical substitute for the physically abusive lancet that doctors possessed most of the time, as non-faithful physicians for the most part. 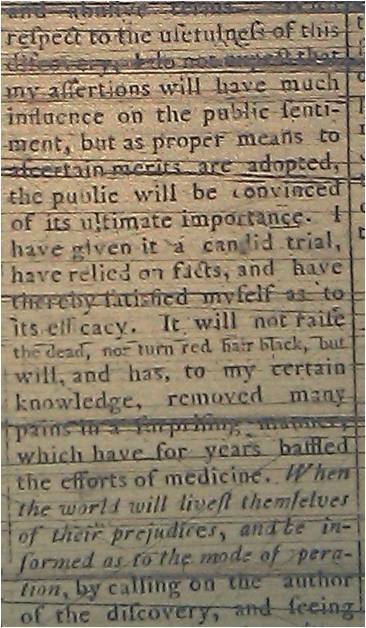 If Benjamin Rush truly honored Winchester’s philosophical reasoning, Rush had to allow the application of this method of treatment to Doctor Reverend Winchester, even if he felt it to be non-traditional, or even worse, “quackery.” Adding more to this dilemma in Rush’s mind, Rush was likely undecided at the moment about the power of galvanism in healing the body, but had to submit to Winchester’s request for this non-physical form of galvanism. Rush was a published writer in the early branches of psychology (a term not really used during that time.) It is possible Rush may have even allowed the use of Points to occur, knowing that in the least this played an important role in helping Rev. Winchester through the problems he was suffering due to “passions”, imagination or imbalanced temperaments. 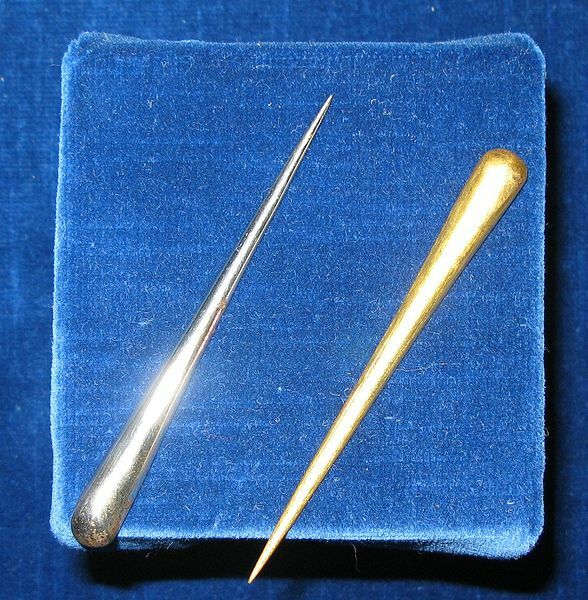 The exact sequence of events is uncertain regarding Winchester’s medical problem and his discovery of the value of Perkins’ metallic pointers. But these two philosophical arguments were in Winchester’s mind just days to weeks apart in April 1797. Either way, this led to Winchester to announce his strong support of Perkins’s new way of curing disease, in the form of the above published letter. This made it much easier for the more open-minded of people to finally take a more serious look at Perkins’s claims, but especially the residents of upper New York and the Dutchess County area who were politically and intellectually Perkins’ neighbors. 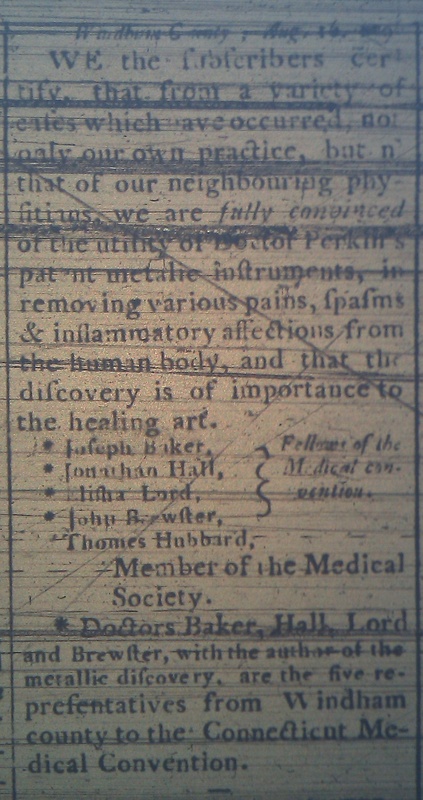 The second item published in the Poughkeepsie Journal on Perkins’s cure was published on February 1st, 1797, two months before Winchester’s medical crisis. It was an advertisement posted by a local seed seller in Oswego Village, Dutchess County. This quaker elder was Daniel S. Dean. Aside from seeds of clover and other newly introduced farming crops, Dean offered a set of these points to anyone interested in purchasing them. No price was given but according to other writers (noted later), the cost would have been anything from 5 to 25 dollars per set. Based on the method in which Dean wrote out the date for this advertisement, “28th of the 1st Mo., 1797”, we can assume that Daniel Dean was a Quaker. 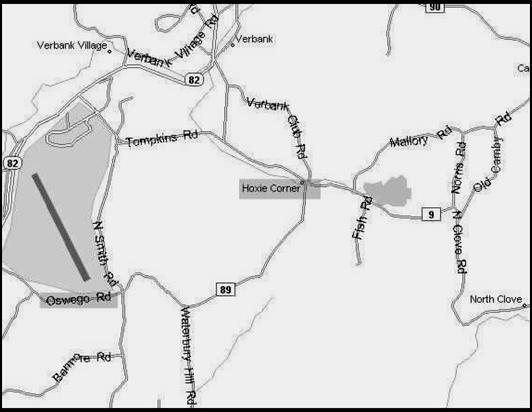 More importantly, Dean lived in the Oswego hamlet south of Verbank (SE corner of today’s airport), just west of the Oblong Patent that joined New York to New Connecticut, one of the most important parts of New York regarding Quaker history. This location not only made him an important social link between Perkins’ residence in eastern Connecticut, and the residents living in western Dutchess County, this location also formed the link from many if not all Quaker towns and hamlets in Connecticut with those in the Eastern Harlem River valley alongside Connecticut and the numerous small Quaker villages and hamlets set up along the center of Dutchess County, from the north edge of the county to its south edge. Gravestone found in center directly in front of the meeting house, about 60 feet to the south of the porch. Could “D. D.” stand for “Daniel Dean”? Once again, like several months earlier, religious background played a heavy role in what would happen in medicine in this part of the Hudson valley duri8ng the very early 1800s. Quaker tradition and philosophy about God, God’s “Spirit”, and God’s form of existence as “Light”, made it easy for a Quaker to immediately understand the natural philosophy underlying Perkins’s mode of eliciting cures. This made it possible for others hearing about this for a second time to finally “see the light” so to speak. For this reason, Dutchess County is where Perkins’ found some of his first very strong supporters in New York, both in and out of the Quaker community settings. With the initiation of John Todd’s business as a local distributor of the points in the Fishkill township, Dutchess County residents no longer had to obtain their versions of the “Metalic Points” from Daniel Dean. The popularity of these points changed their marketing technique from that of a side business to that of a full-time occupation by the end of 1797 (whatever “full time” constituted back then). This meant that Daniel Dean could go back to selling just farm goods, as John Todd became its chief promoter and perhaps even manufacturer of these products, a rare occupation to say the least, but one that was supported very much by Elias Perkins. Following the posting of Dean’s advertisement for “Metalic Points”, the third in this line of Metalic-electric healers was John R. Todd of Fishkill. The exact location of John Todd’s residence is uncertain. He formerly resided just a little to the north and center of the county according to the 1790 census, perhaps just south of Millbrook. Since Todd resided in former Quaker territory it is possible some of his family might even be Quaker. But at the time of his advertisement, it appears as though Todd was residing just south of the edge of Poughkeepsie township, in a small pointed upside-down V-shaped spur of the Fishkill township that resided between Poughkeepsie, Beekman and Clinton just north and east of Poughkeepsie (with the modern LaGrange directly to the west, somewhere close to Vassar College, Rte 55, and/or the Wooden Bridge housing complex just south of Vassar College). Todd’s advertisement wouldn’t be posted for another 6 months once Dean began marketing the Points. We have to wonder, was John Todd a Quaker? There were Quaker families with the last name of Todd residing in Connecticut and Pennsylvania. But according to the note that appears at the bottom of this advertisement, Todd paid for a 3 months posting of his ad beginning “September 9, 1797.” This date is not penned in the traditional Quaker style. Todd may have had the philosophy of a Quaker, but was not a member of any Friends’ House. The lack of close Friend’s Meeting Houses also suggest this to be the case as well, although travel was not really a limiting factor for Quaker religious practice. 2. Mary Elizabeth Todd b: 24 MAY 1819. b. 1890. 3. Robert Thomas Todd b: 5 JUN 1821. mar. Almeda Sprague. With the above [also see list of genealogical references at the end] we learn that John was 25 years of age when he commenced selling Perkin’s pointers out of Fishkill, and was of Dutch [Ver Valin/DeGraaf family]-English/Scottish/Irish [Todd family] heritage. The important historical point made here is the role of Dutch heritage in the continued support and promotion of the electric cure tradition in the Hudson Valley. The Dutch created the Leyden Jar about the time the DeGraafs and Ver Valins came to the New World (late 17th C). Great Britain’s influences in this field were primarily of Scottish and Irish origins due to the nature of the natural philosophy being preached. Regional culturalism had everything to do with the growth of Perkin’s philosophy in the Valley, which required a uniquely different mode of entry into the region than followers of this tradition residing within the Quaker-enriched Harlem Valley region next to Connecticut. Also notice how in the newspaper advertisement for “Metalic Points” that Todd described his place of stay as 3 miles east of Justice Zephariah Platt’s residence. This mention of Justice Platt (the founder of Plattsburgh at the north edge of New York), may be intentional. In the least, this has some underlying social message we must consider, being relayed to the local citizens reading this ad. For this reason there is a fairly interesting sociological lesson we can draw from the kind of “neighborhood support” that John was experiencing. John may have been a different sort of healer, but not so different that he could be prosecuted as being a “quack”, no matter what the regular doctors felt, thanks to Perkins support from the sheriffs down in Philadelphia and our local Justice Platt. Whether or not Todd was aware of Winchester’s history as a religious leader cannot be confirmed, but it was very much common knowledge that the Universalist philosophy had some local meaning. In 1793, a yellow fever epidemic had stricken Philadelphia, which soon after became known as the contemporary form of the “black plague” that devastated Europe centuries earlier by killing as many as 30% of its inhabitants, considered by preachers to be God’s vengeance in its best form. There were two more years of yellow fever that followed, none of which impacted New York that much. However, this yellow fever made its return to New York City in 1797, just when Perkin’s Points became popular. The evidence was there for this device treating all sorts of pain and inflammation, but could it be used to treat the fever? In particular, would it be helpful in preventing the signs of “black plague” (it is referred to this in the Poughkeepsie Journal in Fall-Winter of 1798) from setting in along with the yellow or biliary fever epidemics about to commence? John R. Todd of Fishkill was in the early years of his professional life when he took on the task of marketing and promoting this novel addition to medicine during the period of recovery that ensued in the region once the post-war depression was over. In the last line of the advertisement, notice the mention of his neighbor Judge Platt. This has two possible reasons. The first is the obvious–Judge Platt’s residence is probably a good landmark for someone who many or some of the local area may have never heard of. However, there is another reason it is important to note Judge Platt as Todd’s neighbor. The gentleman who will deliver this letter is Dr. Perkins of Connecticut, a respectable Physician, and Inventor of the Metallic Tractors, for the relief of pain. Strange as his hypothesis may be, experiments give it countenance. In some cases the effects wrought are not easily ascribed to imagination, great and delusive as its power. Should there be cases favorable for experiments in your vicinity, he would be ready to operate; and that in the presence of persons most competent to detect a fallacy, if there be one; or on the other hand, to extend the improvement, if in fact, a new principle be discovered. With great respect, I am, Sir, yours, &c.
If the mention of support by Ellsworth and Marshall were good enough for Perkins, then the mention of neighbor Judge Platt in a similar advertisement months later was good enough for Robert Todd. Chances are Chief Justice did support both Perkins and Todd in their endeavours. If not, wouldn’t he have been the first to react to such incredulous medical claims by his closest neighbor? Perhaps with such an argument in mind, most of the locals also became convinced. Little else has been found about Todd’s business. This use of Perkins Metalic Points was in general a short-lived endeavor for the subscribers, with an invention and small group of practitioners that were outlived many times more by the related philosophy. Even though the theoretical method in which Perkin’s cure was felt to work soon became a popular topic for humorists and ridicule, the lancet did not win out for long over this short-lived philosophy. There were plenty more substitutions for the lancet still waiting to be found in the Hudson Valley. Law and medicine do go hand in hand in more than one way. Not just due to malpractice, but also because medicine and the law worked together quite extensively during this period of medical history. The influences of French physicians in particular, migrating into this country due to the French Revolution introduced to local doctors the concept of sympathy towards the imprisoned mentally ill, for these patients were in need of special housing, not the gaol-life experienced by criminals, according to the French physicians. French doctors also introduced into the county their own takes on the metaphysics of medicine as this pertained to mesmerism and the body’s energies. Just a few decades later, they had a global impact by developing a new way to combine electric cure with acupuncture, thereby producing the first electropuncture needle. Therefore it is safe to say that John R. Todd was not the first to introduce the electric cure philosophy into the Hudson Valley. 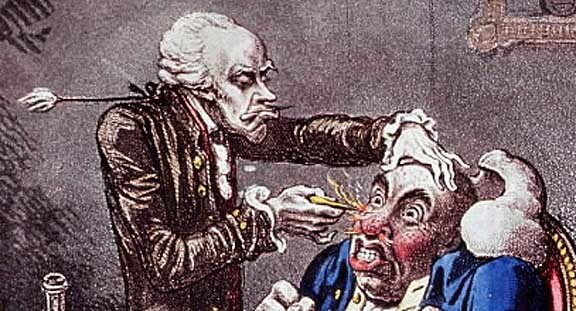 Several generations before, prior to the Revolutionary War, there were at least two versions of electric cure that were probably popular locally. The first was the Leyden jar invented by the Dutch during the late 1600s. 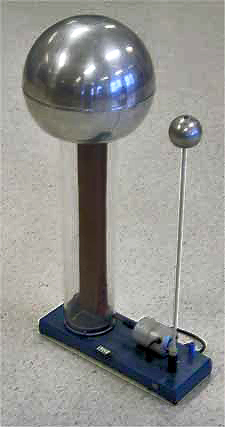 The second was a philosophy that made use of an apparatus similar to the static electric generators first made popular in the 1500s by William Gilbert (1544-1603), who made a hollow globe with sulphur that could hold a charge, an invention the description of which he published in his book De Magnete, Magneticisque Corporibus, et de Magno Magnete Tellure. Over the next century this invention had progressed into something made of glass, such as a glass globe, cylinder or disc that could be spun and through friction made to generate static electricity. This electricity could be stored for a short in the device and then released upon contact by an individual using some sort of conduction device. 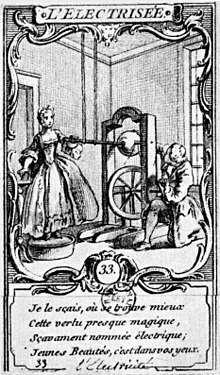 “Elektrisiermaschine” according to Otto von Guericke (1602-1685), published in 1750 by Hubert-François Bourguignon Gravelot (1699-1773) (see http://en.wikipedia.org/wiki/Otto_von_Guericke). Both of these ways of providing electric cure had their periods of amazement and amusement, along with the professional, social and personal “shock” that they provided. Numerous times these practices caught the attention of physicians due to their ability to play into the philosophy of life–electricity could bring small animals back to life for a second or two, or make a seeming dead muscle move on its own in a glass dish, or cause sparks to erupt when enough static electric was generated to ignite a fire. The physicians during this time who were amazed with these practices, at times tried to apply them to treat their patients (for example, infant and adult paralysis due to common infectious diseases for the time, esp. poliomyelitis). There were even several periods in medicine when medical doctors were convinced that these sparks were the spark of life, the source of life’s energy or vital force. Benjamin Franklin made this popular, not by his experiences with the kite, but by throwing an “Electric Picnic” during which he used the spark to roast a turkey. These philosophies turned medical electricity into a unique specialty in medicine that could be practices by the medical trained, and the natural philosophy trained by 1800. Medical electricity became a practice in which doctors tried to relate electricity in its various shapes and forms to the vital force concept and their own interpretations of life and disease, a major topic for dispute in medicine for generations to follow. But it was also a topic preached and promoted by the natural philosophers for the time and place, in particular the Quakers. The content of medical electricity arguments are primarily of a philosophical nature, and no doubt brought back memories to old timers of the pre-Revolution period when Borden’s philosophy of energy in the body prevailed, claiming life was due to some vital energy migrating about the heart and brain and other organs in the body along unique and separate paths. Such followers believed that it was the misguiding and lack of control of this energy that was responsible for disease, a philosophy counter to that of the more physically minded physicians interested in blood-letting, in which imbalances in the four humours and the four conditions (hot, cold, wet, dry) were the cause for disease, with the added attention to the effects of alkalinity versus acidity on health popular in the very late Dutch-American history region of the Hudson Valley. It is no surprise that tradition, history and family heritage had as much to do with making this practice popular to the region as the actual scientific and metaphysical claims. A regular physician’s philosophy for this time would have been far less intriguing than that of local metaphysicians. Once again the score was metaphysicians-numerous votes of public support, regular physicians-almost zero. Adding to this bad luck the regular doctors were having around this time were the epidemics they were failing to treat. In particular, there were suspicions now arising in the church communities that God was punishing us for out Sins in a way that He has made use of before–by sending in a plague. A number of church leaders felt that the recurring yellow fever epidemics were a result of “God’s Will and Intentions.” In the Poughkeepsie Journal on September 11, 1797 it stated that “Upwards of FORTY THOUSAND people have fled from the City …”, referring to the black plague that came to Philadelphia in its new form as yellow fever, with such devastating consequences that this crisis would not be forgotten, even by the local ministers in New York. In Philadelphia, this public unrest led church leaders to beg the government to consider the possibility that God was the cause for the illness–claiming that perhaps by political leaders communicating more openly with God that they could prevent this scourge from returning. In the meantime, New York physicians were beginning to get a handle on the cause for this plague–the large numbers of French vessels coming into the ports due to the Napoleonic War. Closer to Perkins’s and Todd’s households, and in and around Poughkeepsie, New York physicians were taking their own precautions against Philadelphia’s deadliest disease coming to their town. All ships coming in from Philadelphia as well as the Carribean were quarantined or told to return to their original port. If they could not return, such as to France, these boats were often ordered to release anchor at some predefined quarantine site (usually close to Governor’s Island). Few if any made their way directly onto the Hudson River and from there up to Poughkeepsie. The primary evidence for this–the oceanside ports were having large numbers of residents succumbing to disease. The large town of Albany with its own ports bearing many of the same waterside features, had little to no deaths at all. There was no return of yellow fever to the harbors in 1798, and apparently little growth in the metallic tractors profession. In 1799, this led Perkins to travel to New York during the next round of the black plague yellow fever to prove his theory that the points could be used to treat this epidemic. This ended his career as a physician due to the yellow fever taking his life in September of 1799. His son, Benjamin, would follow in his footsteps, obtain a significant amount of support from Denmark and other countries, start an international enterprise and association supporting this cause, and like his father, later lost his life due to the same behaviors once an epidemic erupted in the United States, dying just several years after his father. For New Yorkers and Philadelphians, but perhaps not so much the Hudson Valley folks, Perkins electricity-based natural philosophical movement was over. In spite of Elisha Perkins’ death due to yellow fever and the failure of his invention, the philosophy itself was now fully developed and was not about to go away in the Hudson Valley. The notion that energy could be the cause for disease was very attractive to religious leaders. During the Colonial years it was the Episcopalians who made good use of it due to John Wesley’s support of the electric cure. During the 1800s it would be the Quakers who did the same, and Dutchess County had plenty willing to take this route to salvation so to speak. What made this philosophy so appealing to the Valley was the Quakers definition of energy in relation to God. Quakers had this philosophy about God as an entity composed of universal energy. This view of God allowed scientists to be more attracted to the Quaker tradition, and take on some of their novel philosophies with regard to the observations being made at the time about dead and “suspended animation” (unconscious) bodies, the effects of electric shock on the body of a dead man, and the implications of these findings pertaining to health and medicine. Local Quaker physician Shadrach Ricketson (reviewed extensively elsewhere) is one example of this in the local Quaker history. Another example is a Quaker living over in Dover, Jedediah Tallman (originally from Nine-Partners according to Quaker records), who in 1799 locally marketed a British made Glass Cylinder static electric generator of varying sizes (reviewed elsewhere with Dr. Ricketson, see link below). Like John R. Todd of Fishkill, Ricketson was able to interpret the scientific philosophy of life and incorporate it into his religious paradigm. Quakers weren’t the only people to have this respect for nature and the natural forces. Scientists, physicians and lay people were equally amazed by the events that could take place naturally without intervention by man, perhaps due to God, but also possibly due to the Powers of Nature. These events included volcanic eruptions, the falling of meteors, the sudden development of very strong winds, and the generation of lightning and thunder in the sky. It was this latter event in particular that interested those interested in the Quaker or natural theology take on God and Nature. If electricity was the cause for the lightning sent down to earth by clouds, and God was possibly another such Natural form in the universe, then doesn’t it also make sense that this same type of force harnessed correctly could be the reason, cause and source for life? This was the question on many peoples’ minds, including doctors with a medical degree, even though they rarely admitted to such a heretic practice as a member of their profession. Bringing all of this back to the Hudson Valley, Dutchess County and Fishkill, it took an individual not trained in medicine to bring electric cure into Dutchess county once the war had ended. This philosophy came into the County by way of various Quakers to the North and along the Oblong Patent, but mostly due to the efforts of Todd in Fishkill. Elisha Perkins’ patent on his “Points” was for 14 years, and was filed officially on February 19, 1796. It was for two metal rods, each 3 inches long, one steel and the other brass (the metal content was called alloys in the patent). Each of the two bore a well-rounded handle at one end and a dull point at the other. They typically sold for $25 a pair. The rights to sell them also often involved the right to manufacture them at your home site, beginning with raw ore or scrap metals, a furnace and some blacksmithing skills. This is in large part what made this industry such a local success at the New York border. The number of mines in this part of New York, Connecticut and Massachusetts were substantial. Iron was readily available and at least one copper mine noted in relation to the Livingston Manor (covered extensively elsewhere). Even unexpectedly, the Livingstons had an influence upon this local industry and the form of medicine attached to it–bearing a philosophy unlike that held by most members of the Livingston family (natural resources like mineral springs, climate and topography are the causes for disease and the mode of their prevention), but still close enough to probably make the Livingston’s chuckle at times at the various ways their natural resources could be utilized to effect the cure. It is also possible that there was a local version of these “tractors” discrete from those of Perkins, although this would have led to a patent violation and legal actions also to be noted in the Poughkeepsie Journal–such evidence was not found. So it seems safe to assume that these are a result of Perkin’s enterprise being transported over the Connecticut-New York border, where they were referred to as “points” by the very local manufacturers of these wares. The ways in which these devices were used requires a little explanation and philosophical interpretation. 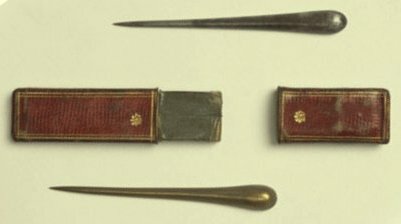 These devices were used to treat a medical problem by passing one or both over the afflicted part of the body, approaching the skin and then making contact with it in the right place. This has little resemblance to mesmerism in how the healing process took place. Even though the philosophies shared a link to the Universal Energy concept proposed by Mesmer, the philosophy of Perkins was based upon a science considered much closer to the biology of the human body. The nerve-muscle impulse and interaction processes. Scientists still had no idea as to how the nerve could cause a muscle to contract, and why a muscle sometimes likes to contract on its own. Both scientists and physicians had their own interpretations of what was causing these events to happen in both dead and alive people. They could no longer explain the cause for these biological events in the body than they could provide a reason for life itself. In spite of the tendency for natural philosophy to facilitate the open-minded approach to viewing this piece of human behavior and existence in the physician’s mind, the physicians wish to remain wellgrounded, not in electric theory based thoughts, but more into their own interpretation of life as a physical consequence of the worlds events, both large, and very, very small events in nature. The local philosophy supporting this form of medicine stated that illness was due to some sort of electric activity. By passing the rods over this diseased area, one could “draw off the noxious electrical fluid that lay at the root of suffering” (quote from wikipedia). This process was used to treat various forms of inflammation and pain, to eliminate gout and rheumatism from within, and to re-excite body parts into operating more effectively, such as a weakened or paralyzed muscle or a failing organ or body part. See also Wikipedia entry at http://en.wikipedia.org/wiki/Elisha_Perkins. PERKINS, Elisha, physician, b. in Norwich, Conn., 16 Jan., 1741; d. in New York city, 6 Sept., 1799. He was educated by his father, Dr. Joseph Perkins, in Plainfield, Conn., and began the practice of medicine there with great success. About 1796 he invented his metallic tractors, which consisted of two instruments, one resembling brass and the other steel, but which he said were of a peculiar composition of metals, three inches long, and pointed at the ends. They were chiefly used in local inflammations, pains in the face and head, in rheumatism, and similar diseases. The points of these instruments were applied to the part, and then drawn over it for about twenty minutes in a downward direction. This method of curing diseases was recommended by the faculty of three institutions of good standing in the United States, and in Copenhagen twelve physicians and surgeons, most of them instructors in the Royal Frederick hospital, began a course of experiments, and gave their opinion in favor of the new theory, which they called “Perkinsism,” publishing the results of their investigations in an octavo volume. In London, where the tractors were introduced by Dr. Perkins’s son, a Perkinsian institution for the benefit of the poor was established under the presidency of Lord Rivers. The published cases of cures numbered 5,000, and were certified to by eight professors, forty physicians, and thirty clergymen. The list of persons who claimed to have been cured by this remedy was enormous. In 1803, after the death of Perkins, the English physicians began to doubt its efficacy, but the theory had numerous defenders, and Thomas G. Fessenden published a “Terrible Tractoration” in favor of Perkins and as a satire on other physicians. A short time before his death Perkins invented an antiseptic medicine, and administered it with great success in low states of dysentery and sore throat. Being anxious to test its efficacy against yellow fever, he went to New York in 1799, during an epidemic of that disease, and, after four weeks of continuous toil among the sick, died of the fever. He possessed great native endowments, public spirit, and generosity, but he cannot be cleared of the charge of imposture in regard to his tractors, which he pretended were of a peculiar combination of metals, but in reality were of brass and iron. — His son, Benjamin Douglas, was a bookseller, and resided for some years in England, disposing of the metallic tractors. He published “The Influence of Metallic Tractors on the Human Body” (London, 1798). Records of the Reformed Church of Albany, NY, 1683-1809 Excerpted from the Yearbooks of the Holland Society of New York has “Marr. with Banns ” listing, 1789-1804, with the following entry: “ Aug. 22 John R. Todd and Clarissa Chesebrough”. Accessed 12-12-2011 at Google Books (LINK). This places Todd in close assocaiton with other important medical electricians like Thomas Gale author of Electricity or Ethereal Fire (Troy, 1802), and Caleb Child (reviewed separately). James Riker Revised History of Harlem, New Harlem Publishing Company, 1904. New York Births and Baptisms: Southeast Region 1660-1916 church records. Ancestry.comCD-ROM (orig rec), 10 MAR 2003. In 1801, John R. Todd removed to Oneida County after Gov. DeWitt Clinton assigned him a Justice of the Peace position for the region. See “Appointments”, upper left corner, in http://fultonhistory.com/newspapers%207/Catskill%20NY%20Western%20Constellation/Catskill%20NY%20Western%20Constellation%201800-1801%20Grayscale/Catskill%20NY%20Western%20Constellation%201800-1801%20Grayscale%20-%200305.pdf. Oswego is the four corners intersection in the following map at North Smith and Oswego Road, just south and east of Verplank. The airport to the left is Sky Acres. Historic Maps Works has an 1876 map of this region with the hamlet name Oswego Village, for viewing and sale at http://www.historicmapworks.com/Map/US/12838/Wing+Station++Dover+South++Oswego+Village++Verbank+Village/Dutchess+County+1876/New+York/. William Snow Miller. Elisha Perkins and his Metallic Tractors. Yale Journal of Biology and Medicine. 1935 October; 8(1): 41–57. Accessed at http://www.ncbi.nlm.nih.gov/pmc/articles/PMC2601307/pdf/yjbm00545-0050.pdf, or at http://www.ncbi.nlm.nih.gov/pmc/articles/PMC2601307/. 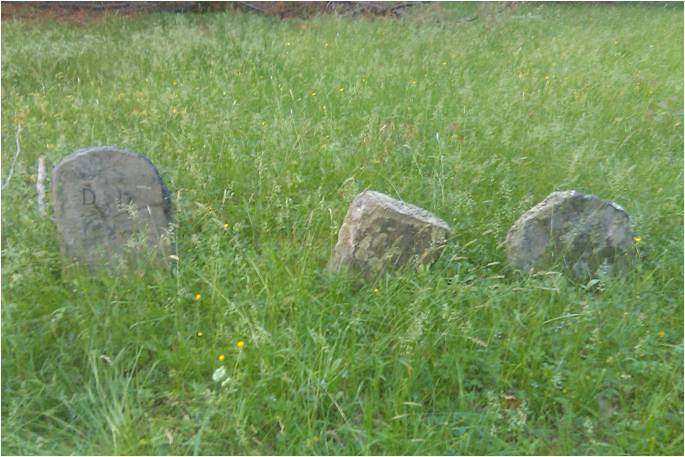 Note: The cemetery for the Oswego Friends Meeting House also has the gravestone of Cyrus Perkins and two other close relatives. However, a link of Cyrus Perkins to Elijah has not been confirmed. This does suggest however that Elijah Perkins, son of Joseph Perkins, may have introduced his “Metalic Points” philosophy to Dutchess County through Cyrus as a relative, who in turn handed over this new and its philosophy to Daniel Dean through the social channels.